After 11 years as Perth’s most prestigious underground dj comp, Habitat have passed over the reins to Geisha for this year. This competition has been responsible for discovering some of Perth’s finest DJ talent, many of whom have gone on to become some of Perth’s top club djs. Past finalists have won a total of 9 Perth Dance Music Awards between them. Not only that, many of our contestants have used the opportunity to get exposure to the industry and have used it as a stepping stone to become residents at many of Perth’s top underground club nights, festivals and events. To enter, upload your minimum 30min mix to soundcloud or mixcloud, and email warwick@geishabar.com.au with your full name, dj name, mobile, facebook page and a link to your mix. Entries must be in by 9pm Sunday 4th November. Entrants may use cd, vinyl, serato or traktor, but no ableton sets are allowed. 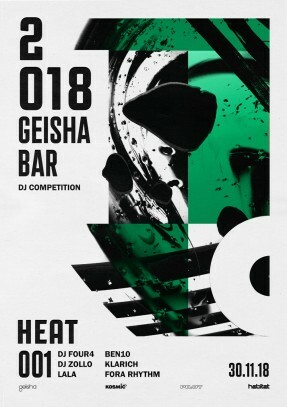 HEAT 3 – Friday 7 December @ Geisha. The top 2 from each heats will go into the final. The winner, as selected by our industry judging panel will get $1000 cash plus the chance to support a yet to be announced international artist at Geisha, plus the opportunity to join the Geisha Dj roster. The runner will receive a $500 voucher from our major sponsor Kosmic. We will also selecting a punters choice winner as well, which we be chosen by the punters on the night of the finals. They will receive a $500 voucher from Kosmic. SO GET YOUR MIXES IN FAST !